During this period, the yield on the US 5-year TIPS (Treasury Inflation Protected Security) has been steadily rising. It’s not a perfect comparison, but you can think about this as the risk free real yield - the yield you will earn after inflation. 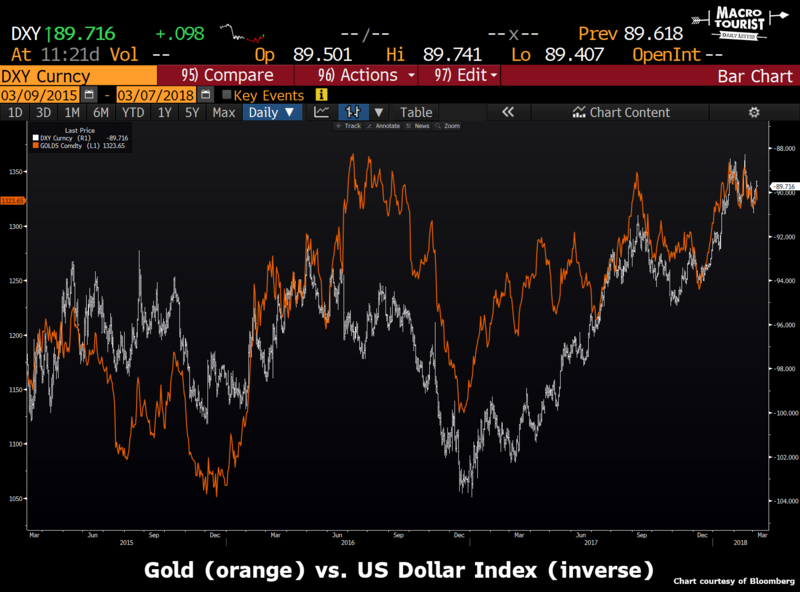 Many market pundits mistakenly believe inflation is the most important determinant of gold’s price level. That’s simply not the case. 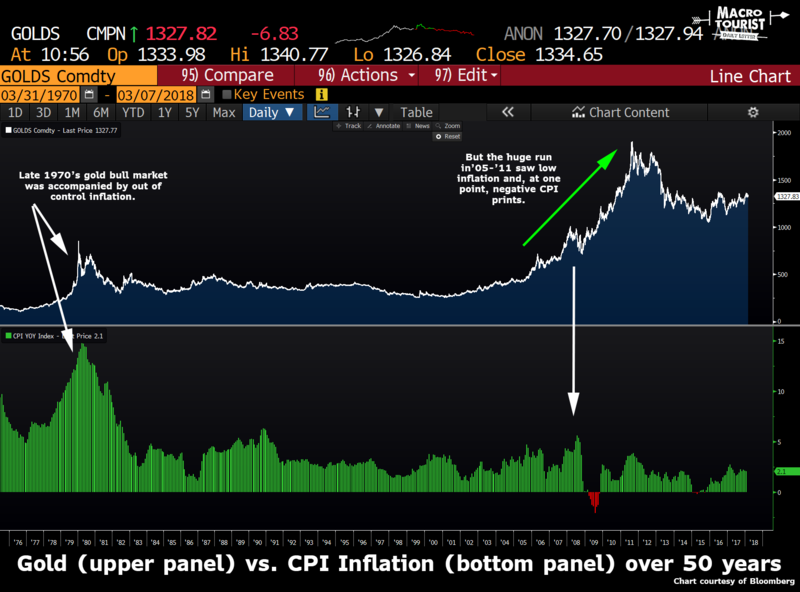 Although the great bull market of the late 1970’s was accompanied by high inflation, the 2005-2011 rise was in the midst of tame inflation, with CPI even ticking below zero for a period. No, inflation is just one part of the puzzle for gold. The other important piece is the nominal interest rate. In the 1970’s, inflation was running at 10% or even higher. But for a while, interest rates were lower than the inflation rate. The real yield was therefore negative. In this environment, gold provided an attractive alternative to holding cash and other fixed income instruments that were suffering from financial repression. After all, gold is also a currency, with no yield. Yet the real benefit is that it is no one’s liability. 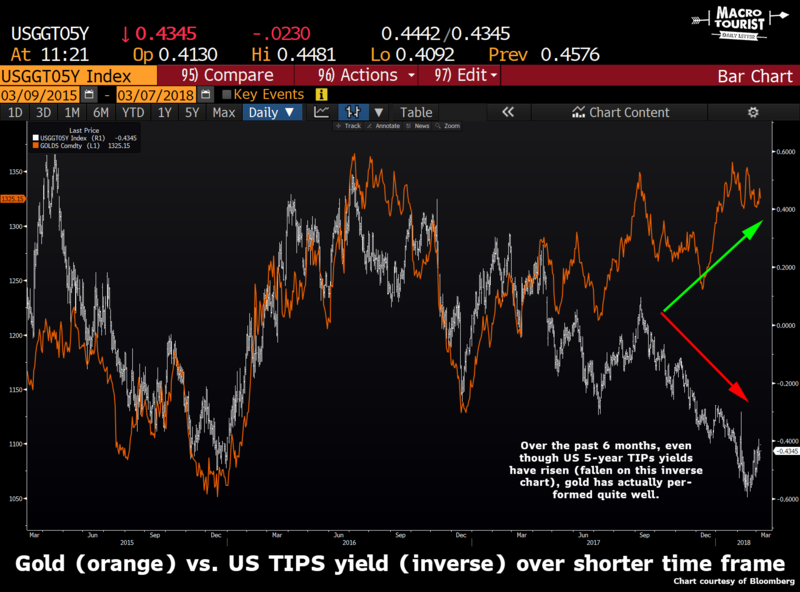 With positive real yields it is difficult to justify owning gold, but push those yields into negative territory, and suddenly gold becomes more appealing. And that’s exactly what happened in the 2000s. Inflation was low, but interest rates were even lower, creating one of the greatest precious metals bull markets of all time. 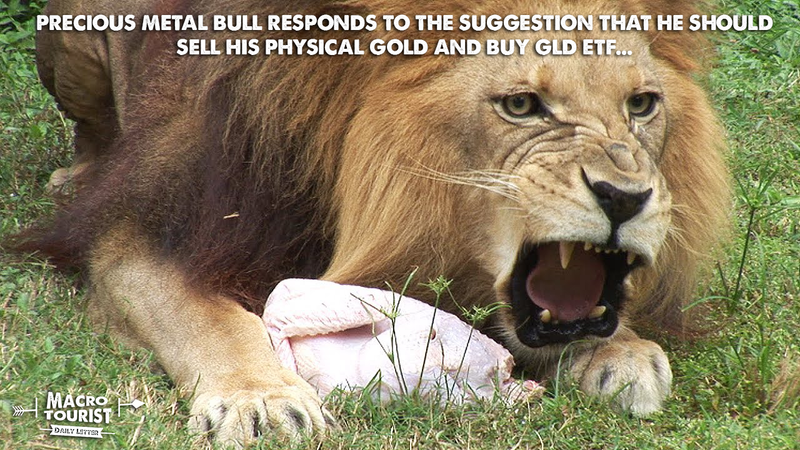 But lately, with the Federal Reserve attempting to normalize monetary policy with higher short-term rates, I have been hesitant to be gung-ho bullish on gold. 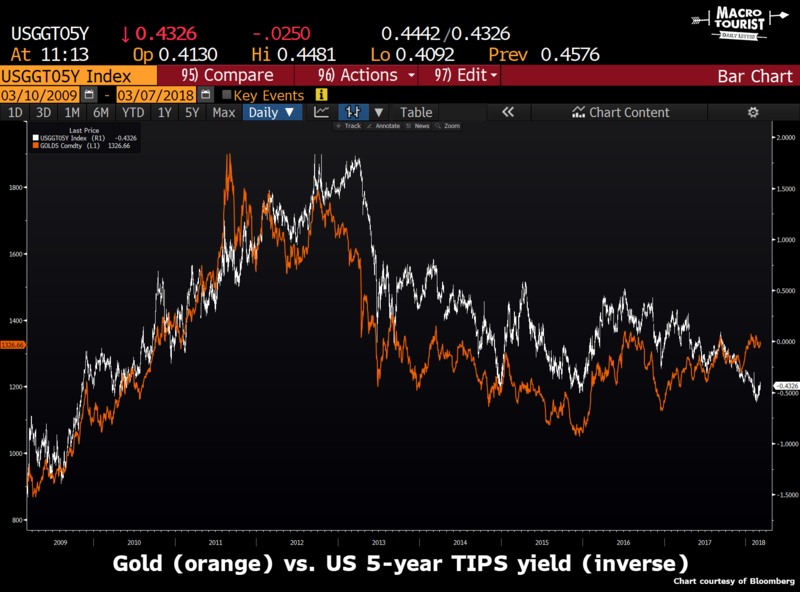 Now I realize gold is more than simply the inverse of the US 5-year TIPS yield, but over the past decade, it has explained a fair bit of the moves in gold. Yet to some extent, my theory has completed broken down over the past six months. 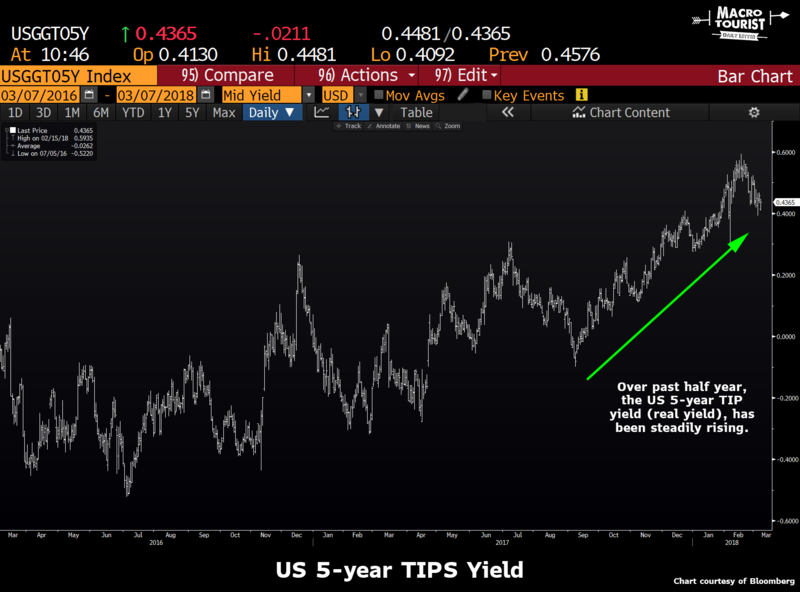 Gold has actually performed much better than would be expected given the big run up in US 5-year TIPS yields (lower on the chart). The precious metal bull in me attributes this outperformance to gold’s inherent attractiveness in this messed-up-world where Central Bankers expand their balance sheets by printing billions of dollars, monetizing it against a myriad of different assets. But the truth of the matter is that it most likely explained by the recent US dollar weakness. After all, gold is priced in US dollars, and if the greenback declines, then we should expect gold to behave reciprocally. The way I see it, one of two things will happen in the coming months. If the economy continues to gain steam, as per yesterday’s post (That’s not a bond bear market), the Fed will lag in raising rates. This will cause real yields to decline as inflation picks up. This will be good for gold, resembling the 1970s period where Fed Chairmen Arthur Burns and Bill Miller neglected to raise the Fed Funds rate as quickly as inflation. But there is another possibility. What if all the economic bulls are wrong? What if China slows down (This cycle - It’s China)? What if all the economic optimism surrounding Trump’s tax cuts are all priced in? 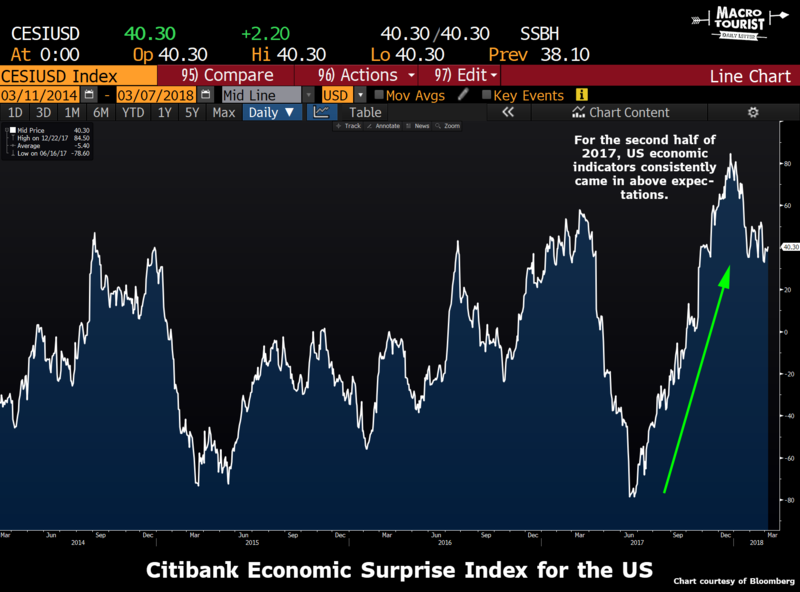 What if the next surprise is the economy slowing down, not the other way round? In that case, the Fed will pause and the massive short position at the front end of the curve will be seriously offside. Short rates will plummet. Gold will rally harder than Heather Locklear parties on a Saturday night. The only scenario that really hurts gold is a strengthening economy that has the Fed continuing to try to get ahead of the curve. I don’t know about you, but I am a seller of both of those possibilities. I remember seeing a Kyle Bass interview a few months back where Kyle joked that he didn’t think Trump understood the extent to which could dictate trade tariffs. He ominously warned that nobody better tell him. Well, I think Trump figured it out. Trump’s foray into protectionism is inflationary. Full stop. Forget about whether it is wrong or right. Remember, an investor’s job is not to determine what should be done, but instead, to adapt to what has been done. And if you think that the Federal Reserve will offset this price shock with higher rates, then you probably hate gold anyway. 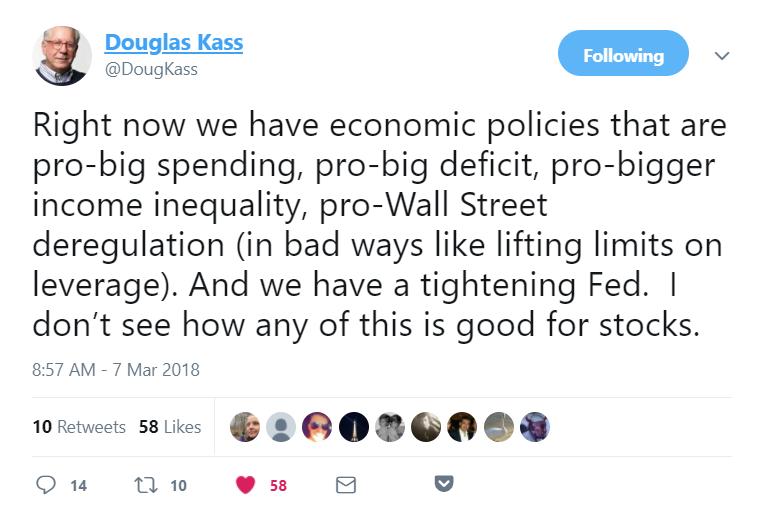 I agree with all his points… except that one about the Fed. What makes him so sure the Fed will continue tightening? I expect we aren’t that far from an excuse to pause.